I make this giant pan of baked eggs several times a year, any time I bring breakfast to my moms group, or any time I host brunch or go to brunch with friends, or really, any time I just know I want to be eating a healthy, protein-rich breakfast and I don’t want to work hard at it all week long. It’s very easy to make. 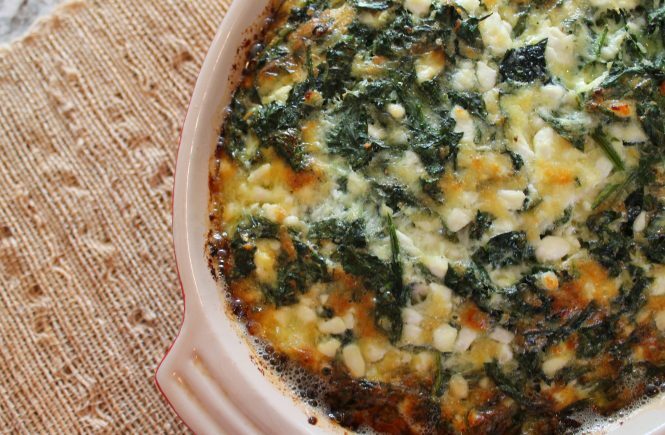 Simply toss a bunch of your favorite greens into a large, glass or stoneware baking dish. I do mean a bunch. 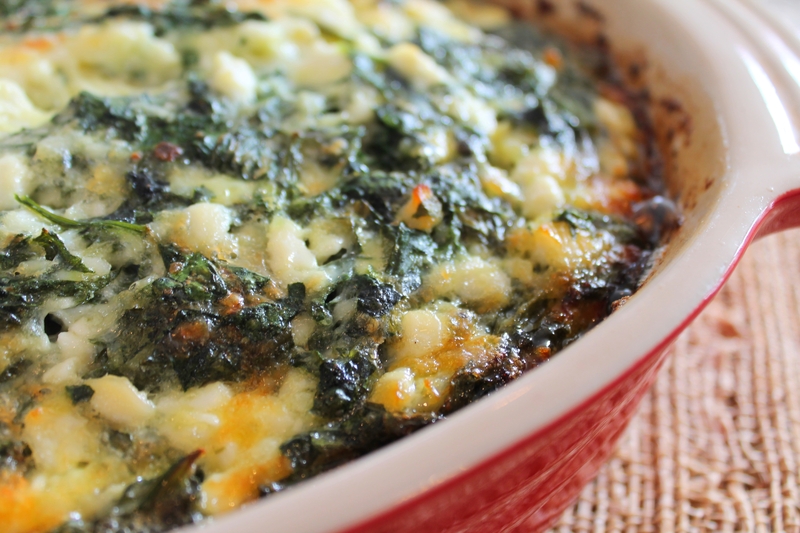 I usually use almost a whole pound of spinach, but I’ve also made this with kale. It’s a good idea to chop your greens up a little, so that the end casserole will be tender. Throw in a few cubes of butter, distributing the butter cubes around the dish. Cover the baking dish with plastic wrap and microwave it for 4 minutes. This will steam the greens, which you must do or the casserole won’t bake properly. While the greens steam, break 12 eggs into a large bowl. Yes, 12 eggs is a lot. I know a lot of people make egg casseroles full of bread or potatoes to create extra bulk, but my favorite thing is an egg casserole that is mostly eggs! I like to start my day with a more hearty, filling breakfast instead of something basically made of carbs that only looks like eggs. Using a whisk, break all the egg yolks. 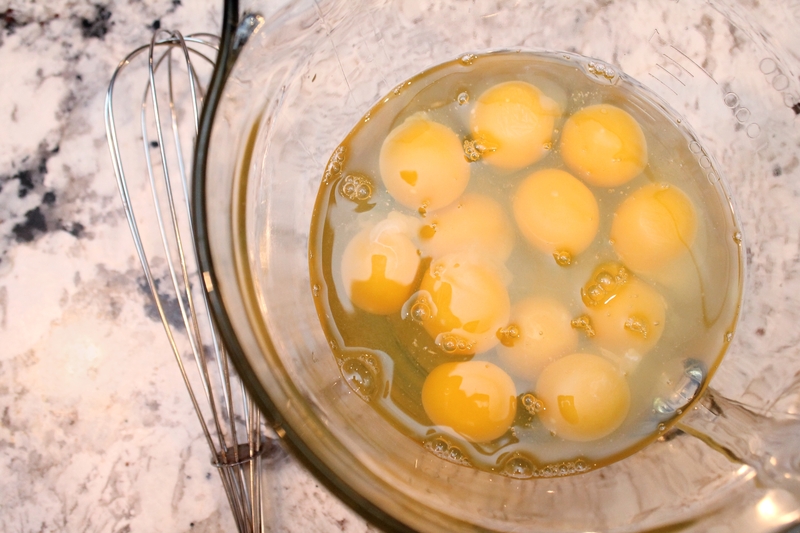 Whisk until the whites and yolks are relatively evenly mixed together. Add milk, cottage cheese (if you hate cottage cheese, never fear! You can make this with full-fat Greek yogurt, or for a really special treat, tzatziki. If you use tzatziki, look for a thick version, or else use half tzatziki and half yogurt, otherwise the casserole will be rather wet), garlic, and flour or cornstarch. Season heartily with salt and black pepper. 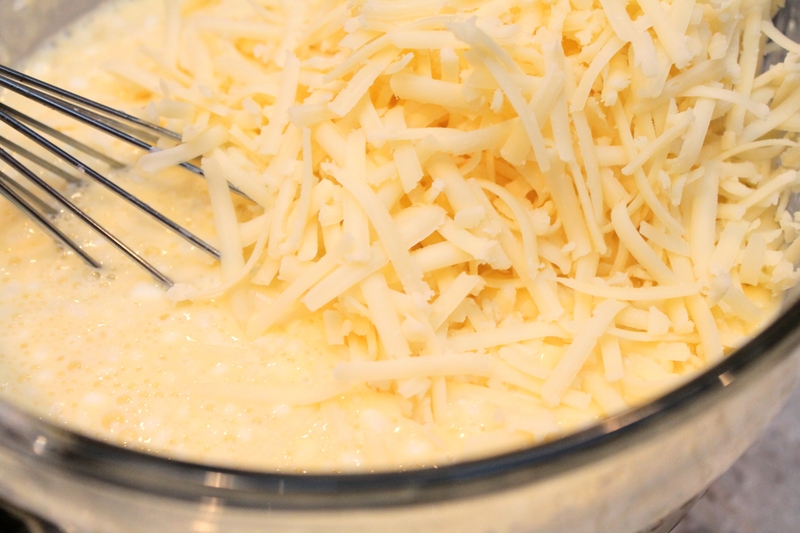 Top this egg mixture with a giant mountain of cheddar cheese. I prefer white cheddar, because visually it blends nicely with the eggs, but yellow cheddar is also fine. Everything you just did can be done the night ahead of when you plan to serve the eggs! 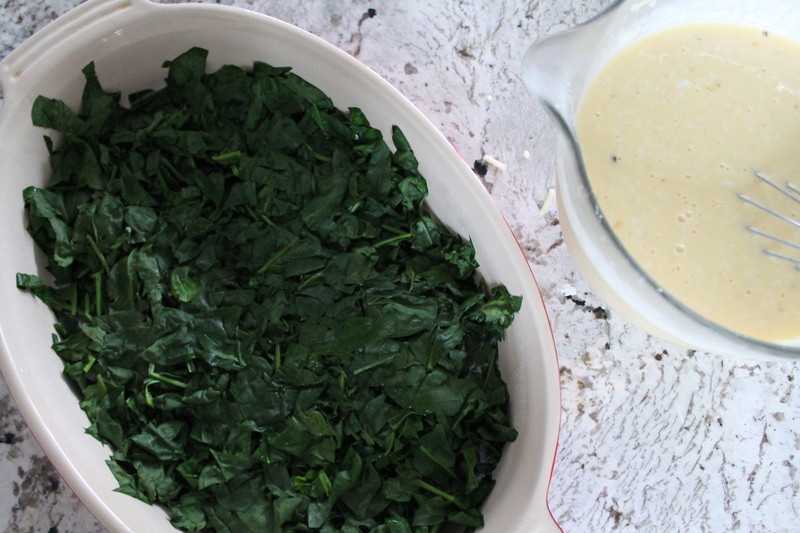 Just keep the steamed greens covered and throw a top on the egg mixture and store them in the fridge separately. 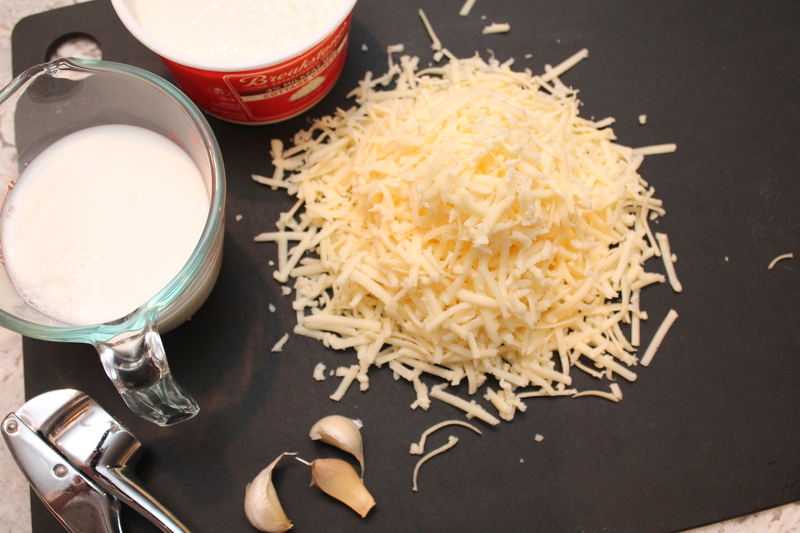 In the morning, all you have to do is give the eggs another quick stir to redistribute the cheese. I cannot even tell you how lovely it is to wake up in the morning and have all the prep for your giant pan of eggs complete! 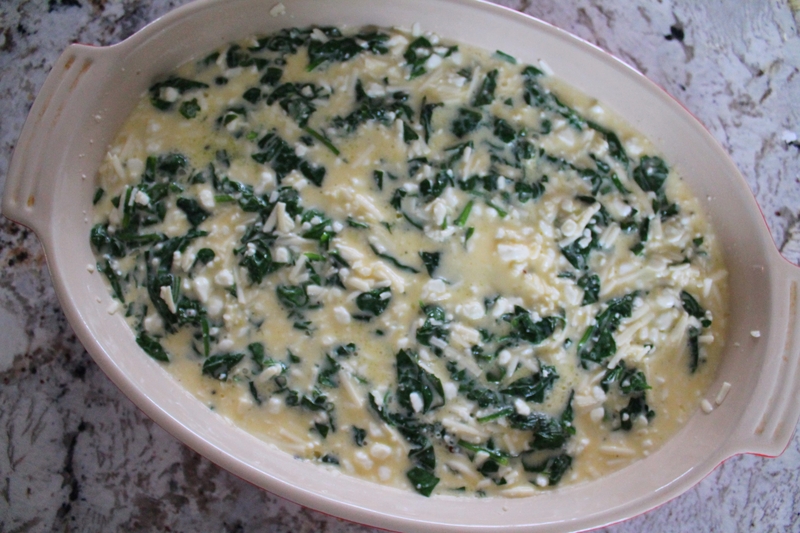 When you are ready to bake, pour the egg mixture into the pan over top of the steamed greens. Using a knife, swirl the greens and the egg together so that there are not two distinct layers. Bake for 50 minutes at 375°. Let it cool at least 10 minutes before cutting. While it cools, it will deflate somewhat. Preheat oven to 375°. Very lightly butter a 9″x13″ microwave-safe baking dish (using part of the 6 tbsp. called for in the recipe is perfectly acceptable!). Roughly chop the spinach and transfer to the prepared dish. Cube the butter and distribute over the spinach in the dish. 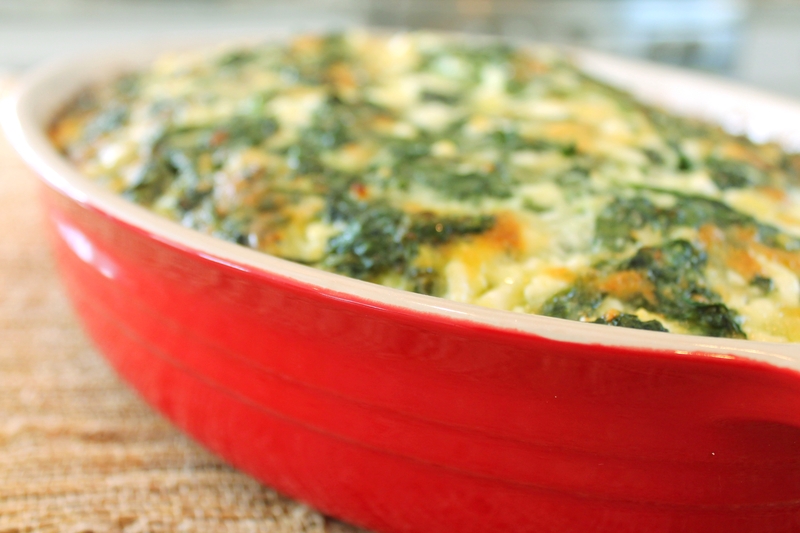 Cover the dish tightly with plastic wrap and microwave for 3–4 minutes to wilt the spinach. 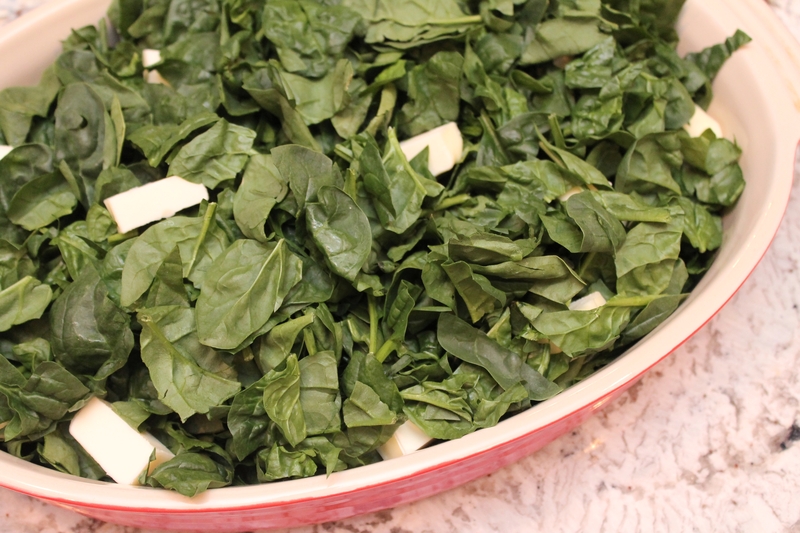 After steaming, the spinach should be halved in volume and still bright green. Meanwhile, whisk the eggs in a very large bowl until the yolks and whites are well broken up. Add all the remaining ingredients and whisk until evenly combined. Remove the plastic wrap and pour the egg and cheese mixture over the wilted greens. Use a fork or knife to swirl the greens through the eggs. Bake for 45–60 minutes, until the center is set and the top is puffed and golden. The center should not jiggle when the pan is shaken. 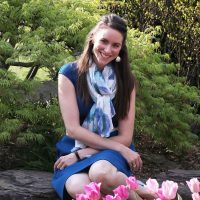 *Or, instead of spinach, use any mix you like of chopped baby spinach, kale, broccolini, chard, or any other cruciferous vegetable or dark, leafy green. 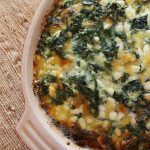 **Tzatziki sauce makes a great substitute for the cottage cheese! It does, however, make the eggs bake up differently because it contains extra produce. If you decide to use tzatziki, look for a thicker version, or else use a mixture of tzatziki and Greek yogurt. Also, add an extra 2 tbsp. flour or cornstarch, and skip the garlic in the basic recipe (as tzatziki already contains garlic).